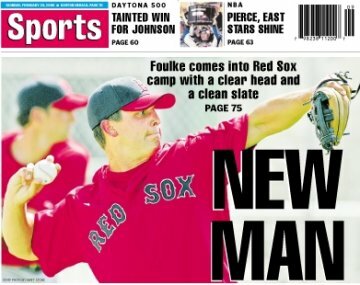 The Globe's Nick Cafardo reports that Keith Foulke has been getting "injections" in his knees for the past two weeks. Curt Schilling threw 22 pitches this afternoon to three minor league hitters. Schilling will throw 30-35 pitches in his first spring start on Friday against Boston College. Rookie Dustin Pedroia said Josh Beckett showed some "pretty filthy" stuff on Sunday. "He's telling us where it's going and it was still tough to hit. He looks like he's in midseason form." ... Terry Francona: "It's very obvious [Beckett] really worked hard this winter. He came into camp very well prepared and ready to go. He's not playing catch-up." I'm going to make the club -- I'm on a mission. ... We really don't have any spots open. Coco is in center, Loretta's at second, so there's nowhere to play every day. I just want to come in and show these guys if you need me, I'm here. ... I want to be recognized as an old-school ballplayer. I know we're in a new era, but go hard all the time, run the bases regardless of where the ball is, that's old-school baseball. Another player fighting for a bench spot is outfielder Dustan Mohr. ... Two articles on Manny Delcarmen. ... Tony Massarotti went to the Yankees' camp and talked with Mike Myers and Johnny Damon. ... Having lost starter Brian Lawrence until August, Jeff Horrigan writes that the Nationals might be willing to trade for either Matt Clement or Bronson Arroyo (first baseman Nick Johnson and outfielder Ryan Church are mentioned). Tony Graffanino has been told that the Red Sox will make a strong effort to trade him to a team that will allow him to play every day. "They have to do what's best for the ballclub, but [Theo] also said if he could get me into a situation where I could play second base, he'd try to do that for me. He said that there were teams that were interested. It's going to be sad if I leave because I've loved every second of this ..."
Chris Snow notes that Dustin Pedroia is #77 on Baseball America's list of Top 100 prospects for 2006, while Baseball Prospectus ranks him at #11. Pedroia's long been a favorite of ours. ... We had him at 49 last year, and he exceeded our expectations. Since we focus more on who we think will have a valuable major league career, someone like Pedroia, who has a higher likelihood of getting and holding a starting job, has an advantage over someone like [Lastings] Milledge, who may have a higher upside but also has a riskier profile. Pedroia combines great baseball skills with a great projection. As for Papelbon [#37], we view pitchers as so risky that only the most elite make our list. Baseball America also has Jon Lester at #22 and Craig Hansen at #54. Curt Schilling faced live hitters -- Tony Graffanino, Kevin Youkilis and Willie Harris -- on Saturday afternoon, and threw 63 pitches. Gordon Edes reports: "The good news is that Schill, unlike last spring, wasn't stopping to check his ankle or fuss with his delivery, no stopping and starting. He worked a very efficient 16 minutes." ... Schilling: "It feels good. I felt strong. ... You get that first batting practice out of the way and you start answering questions." Judging from Terry Francona's comments, Schilling will pitch Opening Day in Texas, and Tim Wakefield may be slotted as the #2 starter and Josh Beckett as #3, which will hopefully keep hitters a little off balance (if they happen to pitch in the same series, that is). Tito: "I have a pretty good idea of how I would like to see this end up. ... We've given it a lot of thought." Mark Loretta will wear #3, in homage to Hall of Famer Jimmie Foxx, who he called "one of the most underrated players in history". Today: Wakefield, Beckett, Papelbon, Arroyo and Jon Lester were each expected to throw eight minutes (35-50 pitches) of batting practice today. Pitching coach Dave Wallace underwent hip replacement surgery on Thursday, and will likely not return to the Red Sox in 2006. Chris Snow quotes Curt Schilling as saying Wallace "literally almost died" last week. Al Nipper has taken over the pitching coach duties. Enrique Wilson, a non-roster invitee: "[Manny] wants to play here. That's what he told me [last week]." John Henry: "If Enrique Wilson said it, we know it's the truth." I have added links to several new Red Sox blogs, so check out the list on the right and click away. Because you can always waste more time today than you did yesterday. Also, if you scroll down, you'll see eight Yankee blogs in their own section. No WBC For Manny; Trot Hitting 5th? Manny Ramirez will not play in the World Baseball Classic. John Henry: "We want to support the baseball classic, but it's actually a plus for us that he's coming here March 1 and not playing there." The team held its first full-squad workout today. I'm excited. I think it's a great time in my career to experience this. I'm excited to experience East Coast baseball, and Yankees-Red Sox and a chance to win a World Series with a traditional team. ... Fenway should work well for me. I'm not really a dead pull hitter. In fact, I like to [use the] middle and the right side of the field, and what's great about Fenway is there's a lot of room in right-center. I'm going to try and hit the ball where it's pitched, and if someone tries to come inside, use the Monster. Loretta says his Padre teammate Dave Roberts gave him the scoop on playing in Boston. ... Jason Varitek on Loretta and JT Snow: "I've heard Snow is a phenomenal teammate. I played against Loretta in the interleague games and he was phenomenal. They're pretty much guys who have a reputation for being good in the clubhouse. Good people to play with." Keith Foulke had another impressive mound session. Catcher Josh Bard: "I think he looked strong. He looks healthy. He was throwing all his pitches for strikes." ... Terry Francona said that Trot Nixon may bat fifth against right-handers. I've always wanted to see him in the #2 spot. Here are his OBPs against righties for the past four years: .348, .423, .397, .483. With the permission of the Boston Red Sox, Manny Ramirez will report to spring training in Fort Myers on March 1, 2006. 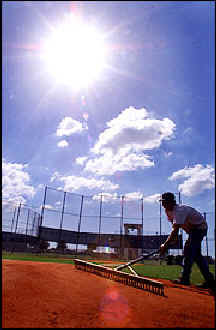 Manny is in Florida completing an extensive training regimen, and is prepared to have an exceptional season. 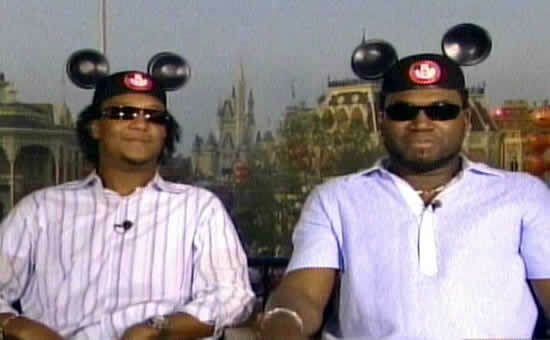 Regardless, I believe Ramirez's teammates when they say they're cool with him reporting within the rules of the CBA. Outwardly he's happy-go-lucky. On the inside he's got a lot of conspiracy theories going on. I would say Manny might be one of these guys [who] when he's 50 years old, he might be in his house with all the blinds shut, kind of looking out like the CIA's after him. Orlando Cabrera stoked the fire by telling the Orange County Register that Manny "really wanted me to talk to people here [Anaheim] to tell them that he really wants to come here. ... They've been trying to get rid of him for the last three years. I don't see no reason why he would be happy." The more interesting aspect of all of this to me is whether Ramirez will play for the Dominican Republic in the World Baseball Classic. If he does, it would mean he'd pop into the Sox camp for one day before heading to Orlando for some workouts before the tournament. The DR's provisional 60-man roster will be cut in half on March 2. MLB hasn't heard anything about Ramirez not playing, but David Ortiz says: "I don't know what he's going to do with the Baseball Classic. I have no idea." I'm a lot more focused. A lot of things are off my mind. My personal life is straightened out. When you see the dark side of life, there's only one way to go. That's up. I was disappointed in myself last year, more than anybody else on earth. I'm my own worst critic. If I'm happy, everybody will be happy. I feel a lot better this year. The other big topic of conversation is Matt Clement and his rebound from his poor ALDS start -- ProJo, Courant, Herald, Globe. Jason Varitek on catching Josh Beckett for the first time: "It's an easy arm action. You almost have to put a governor on him to hold him back a little bit because he looks like he's in great shape." ... What does that mean? Many links regarding Curt Gowdy are here. David Ortiz talked about Manny. Also, when asked what he misses most about Johnny Damon, he said: "Michelle". Good news! Jonathan Papelbon will work out as a starter this spring. [His role] remains to be seen, but he's going to be stretched out and go through spring training as a starting pitcher. We have as many as seven starting pitchers, but those things have a way of working themselves out. You can't get ready as a reliever and all of a sudden be ready to start. You've got to get ready as a starting pitcher, so that's the way we're going to approach it. I think he's a guy you'd benefit more from getting 200 innings out of him [rather] than 60. I look at him as a guy, makeup-wise, who's not far from being a consistent winner in the big leagues. ... [Papelbon] is one of those guys who having him in the rotation makes you a better team. He'll probably still begin the year in the bullpen. Even if (when?) David Wells gets traded, there are still five other starters (barring injury): Schilling, Beckett, Tim Wakefield, Bronson Arroyo, and Matt Clement. Schilling has been talking with Beckett: "I started laying out the media minefield for him. I explained to him that there were three or four of you guys he can trust, and the rest he can kick to the curb." I got a chance to play first base last year. And I played first base my senior year in high school. I have a lot to learn, but it's not like it's new. This spring, it'll mostly be taking a lot of reps at first base and getting the timing down. John Flaherty talks about the Yankees. ... Extra Bases, the Globe's blog, has updates throughout the day. ... The Globe and MLB both have good photo galleries. And SoSher Mike F has begun his daily spring training reports. Back on February 2, I posted SG's results for 100 seasons of ZIPS projections. He has recently run "another 100 Diamond Mind simulations using Baseball Prospectus's PECOTA projections, and the results were far more encouraging for Yankee fans." I see that some of the pre-season magazines are out, so I'll be taking a look at those soon. Then there is the Yankees vs. Red Sox comparison according to Scrabble. Terry Francona has hinted that Kevin Youkilis and JT Snow would split time at first base this year. Some fans (like me) have worried that Francona's tendency to favour veterans might mean Snow would get the regular's spot. Youkilis started only 20 games last season (14 at third base, five at first base, and one at second base). The Globe notes that in his non-pinch-hitting at-bats, he hit .306. He also saw 4.68 pitches per plate appearance; although he had too few at-bats to qualify, his total was far higher than Bobby Abreu's MLB-best 4.39. At 27, it is time to give Yook a full-time job. Pencil him in at first and if Mike Lowell struggles, he can move over to third. In Florida, Tito is calling the 38-year-old Snow a "complement" to Youkilis, but "Who gets the majority of at-bats, we don't know. ... We think Youk's ready to assume some responsibility and be a regular major league player. We think he deserves it." ... It's one of the few battles in camp this spring. Keith Foulke played catch for about 15 minutes on Tuesday, but said he would not speak to reporters until Sunday. ... Trot Nixon was also an early arrival. ... Pitchers and catchers report on Saturday. Position players are due next Wednesday, with the first full-squad workout the following day. Francona on Jonathan Papelbon: "What he's going to do for sure is pitch with a lot of responsibility. Whether that's in the 'pen or as a starter, I just don't know." ... Dustin Pedroia: "I've killed myself this offseason. There have been no setbacks and I've made myself as strong as possible, and I'm ready for a long year. I'm going to try to win a job in Boston." ... A bland article on Jacob Ellsbury in the Oregonian. So Who Can We Blame? 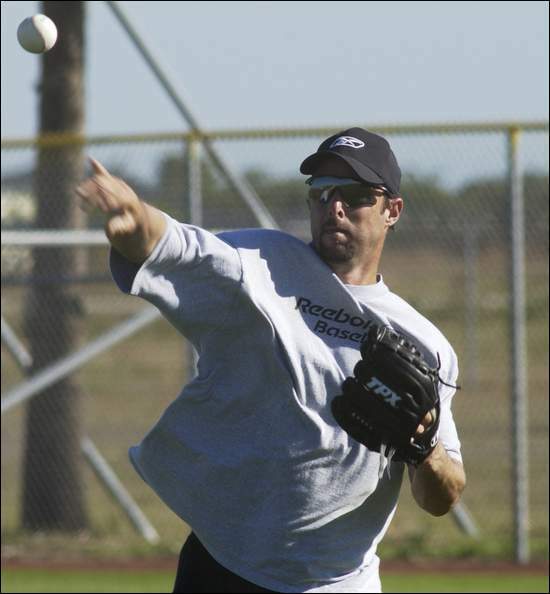 Tim Wakefield is already throwing in Florida. Ken Huckaby has spent the past week at the Carl Barger Baseball Complex in Viera, catching the knuckleballer: "I decided to come down a little bit early and get a feel for what it's going to be like to catch him." Wakefield: "It's nice to have a catcher who knows my mechanics, too. ... He's almost identical to Doug [Mirabelli] as far as his hands are concerned, and he's really easy to throw to." Terry Francona sees the bright side in some Sox vets playing in the World Baseball Classic (March 3-20): "We could be missing two shortstops (Alex Gonzalez and Alex Cora), so that means we’ll now get the chance to see a kid like (Dustin) Pedroia play more, and guys like (Brandon) Moss and David Murphy play the outfield and get extra at-bats." Al Nipper will serve as pitching coach in camp while Dave Wallace recovers from a hip infection. We had a wind study done by an independent consultant. I think you'll find that there might be slightly fewer balls that are going to find their way those last few feet over the fence or over the Green Monster. I think somebody like Ortiz is not going to like that. If I had to worry about the winds, it would be the concern with the [17-story] Trilogy project down the street. It's going to impact the wind. That is the direction [southwest] of the prevailing winds in spring and summer. ... If the winds change, it won't be anything we've done, it will be having a taller building [nearby]. If it were any closer, we'd be really concerned about it. It's probably just on the cusp. Alex Gonzalez hit .409 and led Venezuela to its first Caribbean World Series title since 1989. ... Save a few hits for Boston, okay? "Panic In The Streets Of Boston"
Yeah, it's a regular Pamplona over on Landsdowne Street. Paul Godfrey, the Jays' president and CEO, was in full cheerleading mode, lacking only the pom-pons [sic]. "There is excitement in the streets of Toronto. There's panic in the streets of Boston," he exclaimed in his introductory remarks. Ricciardi was brief in his remarks and guarded in his optimism. "Hopefully, our club will play up to its capabilities ... I think we'll be better than last year." The Red Sox avoided arbitration by agreeing on a $2.75 million contract for 2006 with Coco Crisp. The center fielder is under Boston's control through 2009. After finally announcing its deal with shortstop Alex Gonzalez, the club designated Roberto Petagine for assignment to make room on the 40-man roster. Red Sox BlogWatch: Red loves Manny like I love Manny. ... Randy looks at the Sox' top prospects for 2006. ... I hate the useless Super Bowl, too. ... Andrew is hooked on the Iditarod. ... Alligator Button links to three good articles on fielding. ... BS Memorial wants a DR hat for the WBC. And speaking of hats, never forget The Power Of The Hat (from November 2004). Never. The Red Sox and Josh Beckett split the difference in their arbitration submissions, agreeing on a one-year, $4.325 million contract. Coco Crisp is the only remaining arbitration-eligible player. The Los Angeles Times, reports that the Red Sox offered Manny Ramirez to the Angels in exchange for Ervin Santana, Chone Figgins and two of the Angels' top four prospects (possibly SS Brandon Wood and 2B Howie Kendrick). Boston also wanted Anaheim to assume almost all of the remaining $57 million on Ramirez's contract. I love Manny, but I would do that deal yesterday (and twice today). Obviously, the Angels said no; whether they were able to stifle their laughter was unclear. ... It sounds like the team is content with Manny staying. In this case, they ask for the moon, get shot down, then tell Ramirez "Hey, we tried." He's the whole package, man. ... He was the greatest guy I've ever seen on the pivot, just spectacular. People say, 'Oh, this guy can't replace Renteria. For my money, he can. Yeah, Edgar might hit 20 points higher, but he ain't going to field with this guy. This guy is special. I'll tell you one thing. Those Boston pitchers are going to love having him and Mike Lowell on the left side of the infield. Pick up the phone and call Beckett. I'll bet you two bits he's glad they're there. Vacuum cleaners. Well, he's clearly not the whole package, but I do look forward to seeing him in the field. 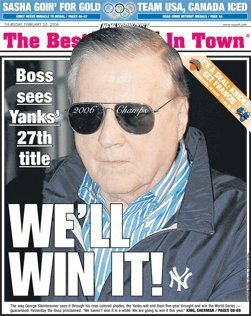 SG of the Replacement Level Yankees Weblog (an excellent blog, by the way) has run 100 simulations of the 2006 season, using Dan Szymborski's ZiPS projections. SG says he'll run a bigger set of sims in spring training when rosters are more set. Here are his sims from 2005 and 2004. Tom Singer of MLB.com writes that the Blue Jays will win the East. Yanks and Sox to follow. 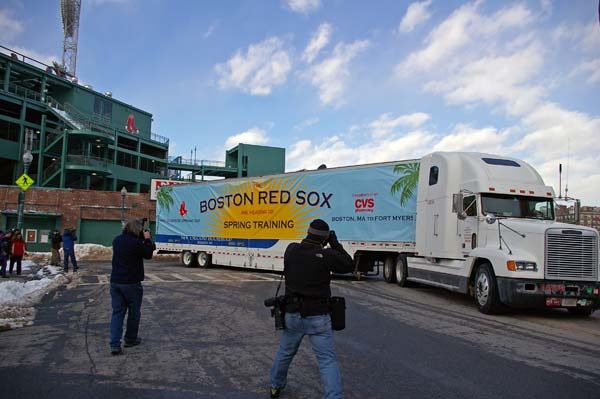 Pitchers and catchers report to Fort Myers on February 18! Position players arrive on February 22 and the first full-squad workout is the next day. Boston plays its first Grapefruit League game on March 2, against the Twins. The Red Sox have invited 20 nonroster players, including Dustan Mohr, Gabe Kapler, Willie Harris, Enrique Wilson, Ken Huckaby, and Dustin Pedroia. Someone emailed me recently and asked about watching the various practices in Fort Myers. I lost your email but some of what you need to know is here.